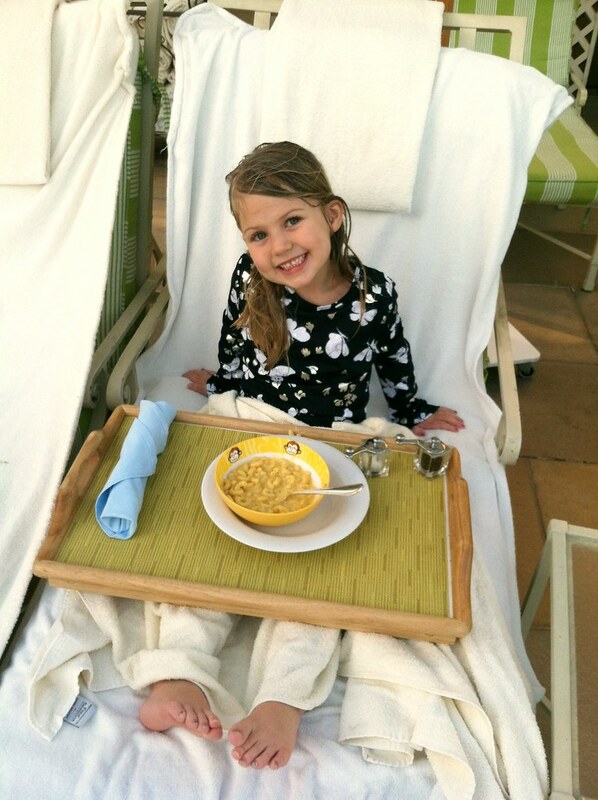 India and I had a little overnighter in Hollywood this weekend. 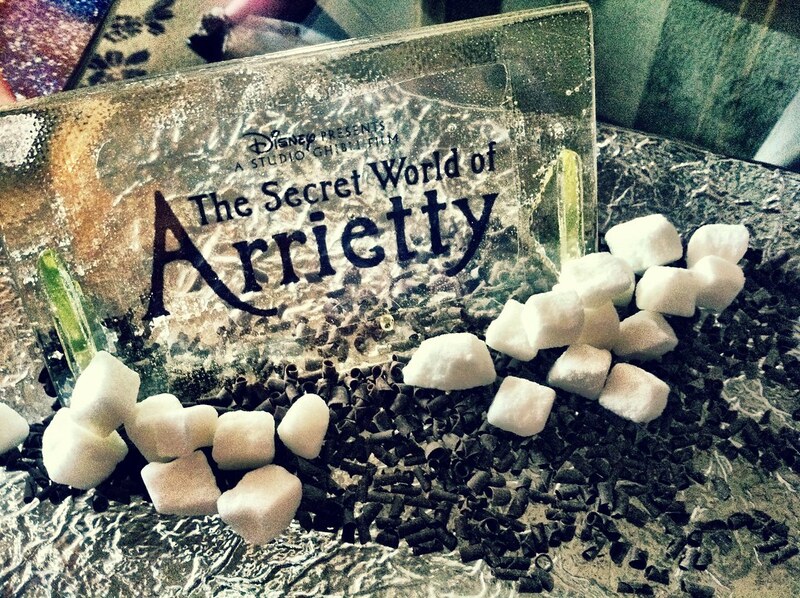 We were invited by Disney to take part in a press junket for the new animated film The Secret World of Arrietty. 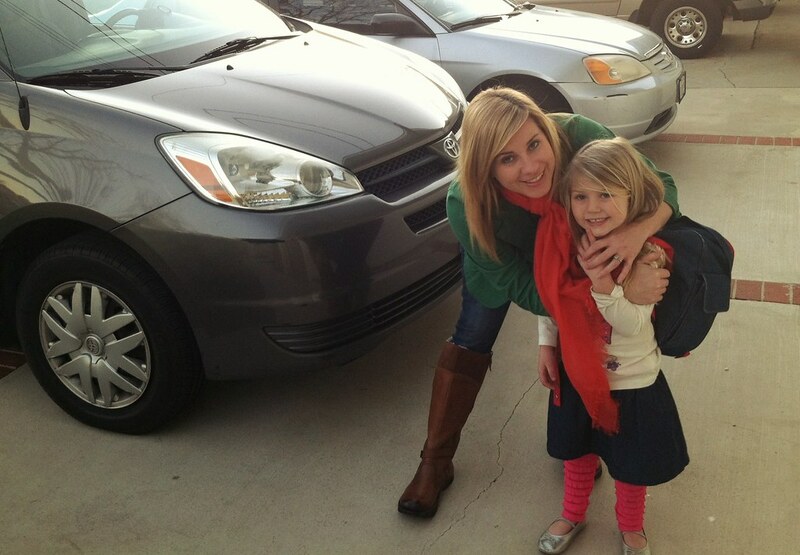 Several bloggers and their daughters were invited to interview the actress Bridgit Mendler, the voice of Arrietty. Bridgit also stars in Good Luck Charlie, one of India’s favorite shows, so she was really excited. There was a screening of the film on Friday night, and since the interview was the next day I decided we would just get a hotel and make a trip out of it. India talked about our trip all week in anticipation. All day she would look at me with a squinty smile and say “CAN’T WAIT!” I’m not allowed to talk about the movie yet, but next week I will have India share her review of the movie. (Spoiler alert: WE LOVED IT). We didn’t make it to our hotel until 10pm. All the excitement was exhausting, apparently. 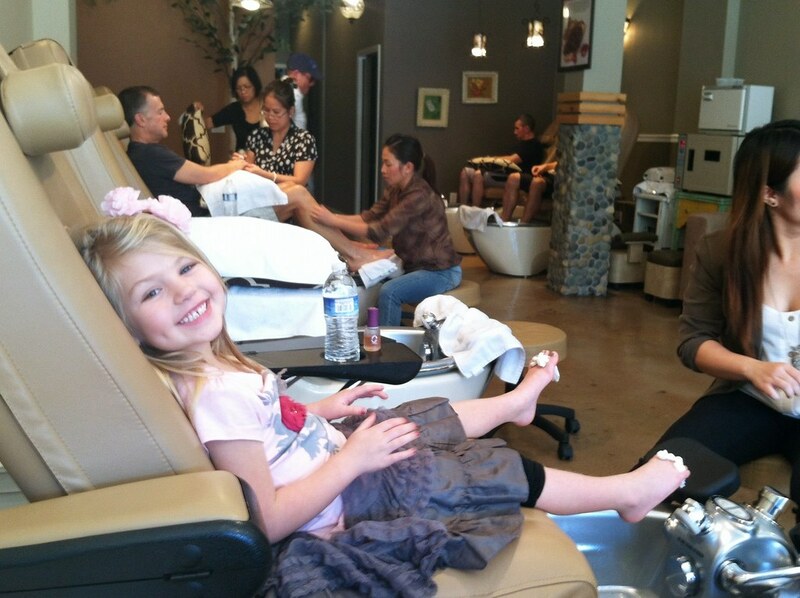 The next morning, we decided to get some Starbucks and a mani-pedi before our big meeting with the celebrity. We were feeling very Hollywood. Look! We even had a celebrity spotting at the nail salon. That’s Adam Shankman in the back corner. I showed excellent restraint by not being a crazed, gushing fangirl when I saw him because, hello? Hairspray and So You Think You Can Dance are a few of my favorite things. And yes, India and I were the only women getting our nails done. We were in West Hollywood, after all. What would you tell girls, a suggestion related to pursuing careers or whatever? I think a great thing about Arrietty is she has a really pure curiosity for the world? You know? She just- she- she wants to see things and she wants to meet people. But she all- she has really great intentions, and she, you know, she meets this boy, Shawn who is kind of having a rough time. And she’s able to be a really good friend for him. And so I think it’s a great message of friendship and adventure. And I think it’s good. I think all girls should feel empowered like they can go out and conquer the world. I think it’s important. When you were younger, what other careers did you want? You know, I was a kid who wanted to do everything. I wanted to be a chef, a gymnast, the President, a lawyer, I wanted to be everything. So through my job, I can do a lot of different things. Is your schedule really rigorous? I usually shoot on Thursdays and Fridays and then Monday through Wednesday I’m rehearsing for the show. Um, this week has been a special episode, I’m not sure if you’re following the show. But we just filmed the episode where they have the, the, the next baby. Um, so it was, it was a big episode. Um, so they have all sorts of publicity in there for that. But, um, it’s been a, it’s been a very busy past two weeks filming that. But besides that- it’s, it’s really not that bad. I mean, you know, they- the nice thing about our show is, it’s really an ensemble cast, so they have a bunch of different, um, story lines with a bunch of different characters. What did you do to prepare for the role? You know, actually I just, I watched the movie and, um, it, it was really visual and, and I thought that it was, it was pretty captivating as a story too. And I think, um, I was pretty familiar with the Studio Jubilee movies and, and, um, Japanese films in general from watching, um, Spirited Away and Ponyo and then there was, uh, what was it, the Kiki’s Delivery Service. And so I, I loved all those movies growing up. And so I was kind of I felt like I was familiar with that aspect. Um, and I think the – kind of the cool thing about this movie is like you’re taking a Japanese film and you’re putting an American spin on it. And so I think it was kind of fun actually to be able to just kind of act like a normal girl. Um, who happens to be [LAUGHING] this big through the movie. Did you enjoy recording with the other cast members? Actually I just met two of the cast members today. I didn’t even know them before today. I, I, yeah I didn’t record with anybody else. Just myself. What was your favorite part of playing Arrietty? I think she’s a fun character. I think she’s pretty spunky, she’s pretty cool. And, uh, yeah. I, uh, I, I like that she has her heart in the right place. So, felt like she was giving some good messages. Can you relate to her? I, yeah I, I think I was pretty adventurous when I was younger. And I, I love liked exploring outside and I was- I was into climbing trees and rocks and all that stuff. And, um, you know, I think I’m still pretty, uh, youthful. And so- I, I felt like I could relate to her. 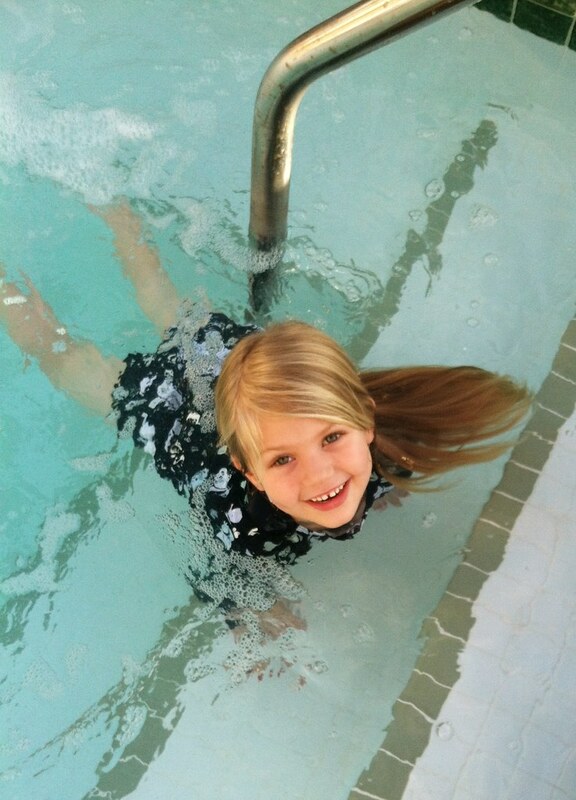 After the interview (and an Amy Poehler spotting in the elevator) we decided to take a little dip in the pool. 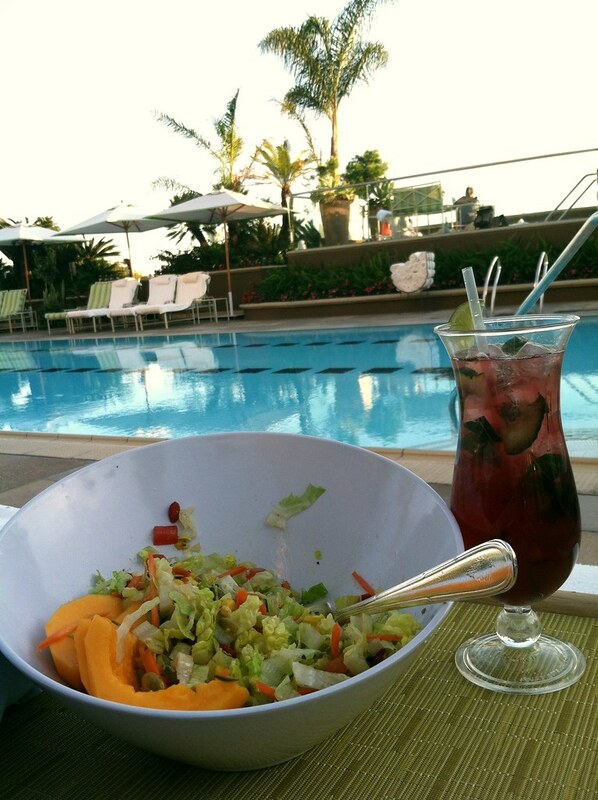 Fun fact: if you order from the kid’s menu poolside, your food comes in a monkey bowl. Fun fact: India is a hot tub surrounded by talent agents in this photo. It was like a scene from Entourage, only with a small child splashing water into everyone’s cocktails. Fun fact: My drink was made of cucumbers, pomegranate juice, basil, and vodka. 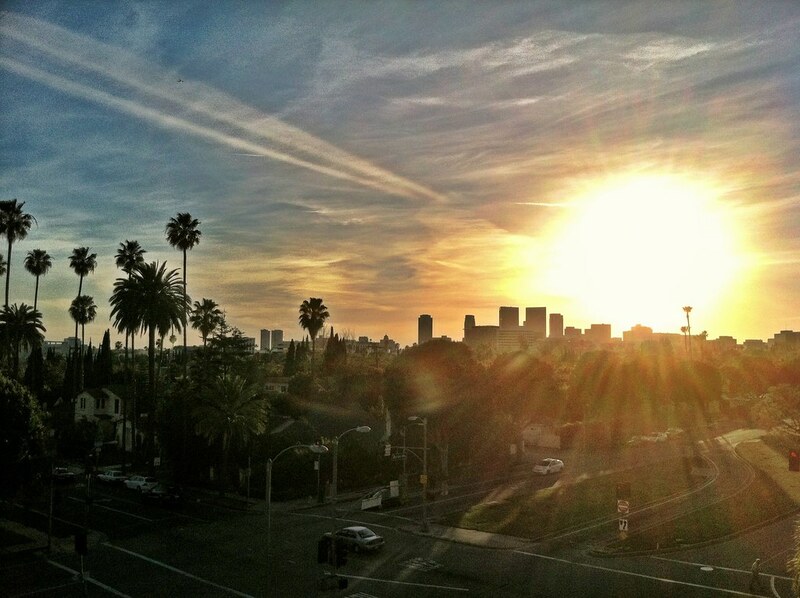 Fun fact: We live just close enough to LA for it to be a fun destination spot, but I’m always thankful to head home. I will have India share her take on The Secret World of Arrietty later, but in the meaning, you can check out the trailer below.